This close-up lens is for use only with the Auto-1:1 Macro Lens 80mm f/4 (not the earlier manual version), and extends the maximum magnification with the Telescopic Auto Extension Tube 65–116 from ×1 to ×2. Reproduced with permission from the copyright owner, Olympus Optical Co., Ltd. This high quality close-up lens is specially designed for use with the ZUIKO MC Auto-1:1 Macro 80mm F4 lens to extend its magnification range with the Telescopic Auto Extension Tube 65-116 from 1× to 2×. 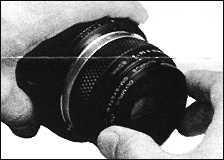 Screw the close-up lens into the MC Auto-1:1 lens. Rotate the close-up lens counterclockwise to remove. If it is hard to unscrew the close-up lens, use a wrench provided. Do not leave the close-up lens in high temperature and humidity. if the unit is rapidly transmitted from low to high temperature places, it will sometimes become moist with dew. Wipe It off carefully. Do not screw the unit with excess force. Avoid the use of this unit with any other lenses than the MC Auto-1:1 Macro 80mm. Avoid the use of this unit for photographic magnification 1.2× or lower (since the Macro 80mm lens brings a better result without the close-up lens in such a case). F numbers 5.6 or larger (for smaller lens apertures) are recommended for better results. 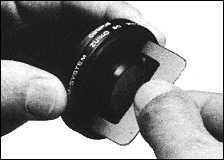 If a filter is hard to remove from the close-up lens, hold the close-up lens and rotate the filter, pressing on its knurled ring, or use a wrench provided, inserting its pins into the recesses on the lens flange, and unscrew.